Bermuda has numerous tiny islands (should be called islets really) that are lying scattered in its waters. Most of them are uninhabited and many are close to the shore and can be easily accessed by a rental boat. Sail boats are heavier and therefore need deeper waters, and can be great for sailing along the coast line at a distance. But for exploring the islands, nosing the boat into it for a swim or a picnic, or getting real close to some of the coastal areas, you will need to rent a small motor boat. Such exploration can be ideal if you are looking for an offshore romantic time while exploring the islands, its flora & fauna, the hidden coves & beaches, and planning an exclusive swim, snorkel and picnic in a serene environment. You won't find a tour operator offering such boat rides. Like the idea? All you need is a little sense of adventure and money in your pocket. The rest will be organized and guided by the boat rental operator. They will provide life-vests and other gears to ensure that you do not face unnecessary risks & hazards in your zeal to uncover the treasures of the ocean. Which islands in Bermuda to explore? There are some 180 odd small islands that are part of Bermuda and they lie in the Atlantic waters surrounding the main island of Bermuda. Some of them of course lie in inshore water areas like Great Sound, Castle Harbor, Hamilton Harbor, Harrington Sound and so on. While I'll come back to the inshore islands shortly, let me start with the islands that lie off the western shore of Bermuda. Refer to my Bermuda Map and expand the western section of the map until you can see Somerset Bridge, Ely's Harbor and the nearby islands like Bethell's Island, Palm Island etc. This is a great place to start a coastal boat ride and then go off shore to explore some more beautiful islands of Bermuda that lie within short boating distances. You can start the boat ride from Robinson's Marina located next to Somerset Bridge or Pilchard bay close to it, or Kings Point at the coast of Mangroves Bay. All provide access to western water area and are advantageous for the cruise ship passengers docking at the Kings Wharf or Heritage Wharf (in Royal Naval Dockyard) because it takes only 10-15 minutes to reach by bus or taxi. The dockyard is located at the western tip of Bermuda in Ireland Island. From the Somerset Bridge area (Robinson's Marina), drive your boat out through the opening of Ely's Harbor and you will soon see a series of small islands. Skip the first one (Bethell's) and come to Palm Island. Although it's part of Bermuda's nature reserve, this island is open to public and has a beautiful tiny beach where you can park your boat. Check out Palm Island to know more about this island. It is less than a mile from the shore. The next one Morgan's Island is also part of Bermuda's nature reserve, but its access is restricted to public. As you go further up along the western coast, you will pass by Margaret's Bay and reach the beautiful Daniel's Head. You will notice the lovely Daniel's Head Park & beach, and the 9-Beaches Resort with its on-water cabanas (closed now for renovations) on the way. There are several small secluded beaches in the Daniel's Head area where you can park your boat, and enjoy a swim and snorkel. Just off Daniel's Head, there is another small island called Daniel's Island which is restricted to public access. Further west of Daniels' Island (about 450 yards away) lies the popular tourist landmark, the HMS Vixen, which is a partially submerged shipwreck with the front part of its hull jutting out of the water. This area is full of fishes and you can hand feed them. As you go further up along the coastline, you will pass by Somerset Long Bay, and reach three other islands off the western tip of Bermuda - Inner Kings Point Island, Middle Kings Point Island and Outer Kings Point Island. This area is about 4 miles off the point from where you started (Robinson's Marina). Inner, Middle & Outer islands are located near the north-western entrance of Mangrove Bay. The main island to target here is the Middle Kings Point Island which has a lovely tiny beach where you can park your boat and have a great picnic, swim and snorkel. If you want to directly go for these three islands, then a better location to start your boat ride is from Kings Point, which is located at Somerset (Sandys) and at the end of Cambridge Road (near Cambridge Beaches Resort). 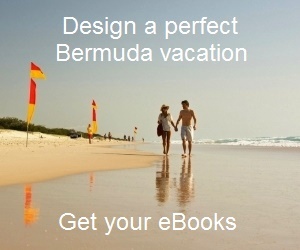 There are several inshore islands in Bermuda. One of our favorites is the Castle Islands, a group of small islands located at the entrance of Castle Harbor and near the tip of Tuckers Point. Castle Harbor is a large water area located at the eastern side of Bermuda between St. David's Island (of St. George's Parish) and Hamilton Parish. These islands in Castle Harbor are great for nature walks, bird watching and picnics. There are old historic forts in the islands which are part of UNESCO World Heritage Site. Check out Castle Islands to know more about these beautiful islands, what you can expect there and how to reach by boat. Another wonderful Island is Nonsuch Island which too lies at the eastern entrance of Castle Harbor. This is part of Bermuda's Nature Reserve and some areas of the island are restricted from public access. However you can reach there by boat and take a walk along a wonderful trail. There is a small bay and a beach ideal for private picnic. Bermuda's conservationist (now retired) David Wingate was instrumental in restoring this island to its original state of flora & fauna that existed in 1600s prior to human settlement in Bermuda. NOTE: Access to Nonsuch island is now restricted. Which are the top boat rentals in Bermuda? But how do you choose the right boat rental company and the right boat for yourself? That really depends on the water area that you plan to explore. There are several operators in Bermuda who offer boats on rent. But there are few that are the best and offer boats in great condition along with all necessary safety gears. Visit Boat Rentals to know about the best boat rental operators in Bermuda, their locations, contacts, and offerings. 1) Bermuda Boating Tours: The top boating & sailing tours in Bermuda. 2) Bermuda Activities: All the recreational activities in the island.